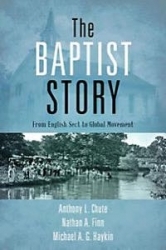 Beeson Podcast features "The Baptist Story"
In the latest Beeson Podcast, Timothy George talks with Anthony Chute, Nathan Finn, and Michael Haykin about their book, The Baptist Story: From English Sect to Global Movement. Books At a Glance has posted a recent interview with Anthony L. Chute, Nathan A. Finn, and Michael A. G. Haykin, authors of The Baptist Stor y. Books At a Glance (Fred Zaspel): Hi this is Fred Zaspel executive editor here at books at a glance. Today we are talking with three authors Tony Chute, Nathan Finn and Michael Haykin about their new book The Baptist Story: From English Sect to Global Movement, a new textbook on Baptist history. We’re glad for the book. Were glad for them to be with us. Welcome you guys. Thanks for coming. If you are unfamiliar with Ligonier’s “5 Minutes in Church History” podcast, then I certainly recommend giving it a listen. Host, Dr. Stephen Nichols, does a fantastic job teaching church history in an engaging and accessible way. It’s the kind of podcast that appeals to a graduate student in theology or a faithful churchgoer interested in learning more about “our family history,” to borrow Dr. Nichols’ phrase. There is one particular episode I would recommend for readers of the AFC blog. In an Episode released on August 5th, “Lon to Phil,” Dr. Nichols introducers listeners to two Baptist confessions of faith, the 1689 London Baptist Confession and the 1742 Philadelphia Confession of Faith. Update: There were some challenges to the details of the episode, which Dr. Nichols addressed here.